We are Manufacturer of UPVC Tee. 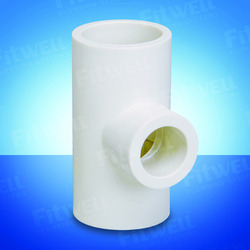 Enriched with vast industrial experience, we are engaged in offering a wide range of UPVC Reducer Tee to our clients. 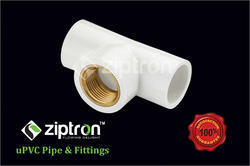 This UPVC Reducer Tee in designed to provide steady joint to pipes. Our product is available in different sizes, range and specification in the market. With tremendous effort and hard work, we have been able to offer superior quality range of u-PVC Reducing Tee for our clients.Used to connect a reducing soil/waste pipeline to the main pipeline at an angle of 87.5 degree. Available Sizes: 3/4"x1/2", 1"x3/4", 1"x1/2", 11/4"x1", 11/2"x1", 11/2"x11/4", 2"x1", 2"x11/2"